With many high profiled in-state 2017 recruits visiting Michigan on Tuesday, it was a 2016 recruit who stole the show, as OG/DT Michael Onwenu committed to the Maize and Blue. 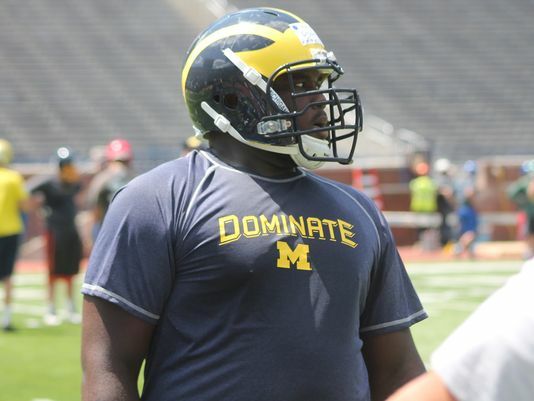 Onwenu, who was on his fifth visit to Ann Arbor, took to twitter to announce his college decision. Onwenu is a dual threat in the trenches. He plays both offensive tackle and defensive tackle at Cass Tech and could see playing time at either once he arrives in college. As an offensive lineman, Onwenu is an excellent blocker. He sets his feet quick and identifies his man. Has good lateral agility and can pull off the line to set blocks down field. Surprisingly good speed for someone his size. Does an excellent job of getting low and extending his arms into the chest of the lineman and propelling them backwards. While he played tackle for Cass Tech, in my opinion, Michael is better suited off as a guard at the collegiate level. On the defensive side of the ball, Michael is just as efficient. He uses his massive frame to drive back the offensive line. Gets off the line of scrimmage in a hurry and uses a bull-rush technique very well. Has a very strong frame and uses his strength to his advantage. Has the ability to break through double teams. Does an excellent job of keeping his feet moving while being blocked and turning the guard sideways, thus making it easier to shed his block. Gets low on the quarterback/running back and wrapping up and is a sure tackle once he’s made contact. Michael becomes the seventh member of Michigan's 2016 recruiting class joining; QB Brandon Peters, RB Matt Falcon, OT Erik Swenson, LB Dele Harding, LB David Reese, and FB/RB Kingston Davis. With two commits now in the fold along the offensive line, Michigan will likely look to add 1-3 more maulers to shore up the offensive line.